The lawyers in Constangy’s Transactional Solutions practice group are your go-to partners in identifying the labor and employment law issues impacting corporate transactions, ranging from large scale mergers and acquisitions to small business unit purchases. Whether it be conducting due diligence of a possible acquisition target or engaging in a workplace audit to ensure that your company is positioned ideally for a private placement, IPO or acquisition, we can provide transactional solutions at a competitive price. At Constangy, all we do is workplace law. Our clients contact us when they are faced with employment law challenges, ranging from litigation to day-to-day hiring and firing decisions. When those same clients are involved in transactions involving labor and employment law issues, they often turn to their (generally more costly) corporate lawyers instead of us. We want to change that dynamic. The lawyers in Constangy’s Transactional Solutions practice group are more than just “transactional” lawyers – we are on the front lines actually handling the types of issues we identify during the diligence process. 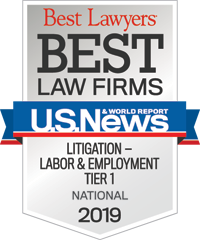 We have lawyers with experience in every area of labor and employment law, including “traditional” labor (union) relations, OSHA, immigration, ERISA, wage and hour, trade secrets, employment discrimination, harassment and retaliation and restrictive covenants – all of whom are here amongst our nearly 200 lawyers ready to assist with your transactional needs. Many of our lawyers came from “full service” firms, or from in-house positions, where they worked on the labor and employment aspects of corporate transactions. We are experienced at working with our client corporate lawyers. In fact, corporate law firms often turn directly to us to assist them in identifying and rectifying unique labor issues for their clients. Our goal is to ensure that all employment liabilities are identified during the transaction process, and – on whatever side we’re representing – addressed in the most beneficial fashion. And, more than just identifying “negatives,” we are here to assist in handling more amorphous issues, like helping you integrate two different employer cultures into a harmonious single workplace. We work with our clients both to ready them for – and assist them during and after – the transaction process. When companies are preparing for a transaction, they want to identify any issues which may derail the process. Our Transactional Solutions group attorneys are experienced at conducting employment practice audits, identifying – among other things – whether your company is compliant with the numerous federal, state and local labor and employment laws governing the modern workplace. And, if we identify a problem, we are here to develop a cost-effective solution. When our clients are acquiring a company or business unit, we are experienced at handling labor and employment due diligence, including review of EEOC and state agency matters, settlement agreements, unfair labor practice charges, employment litigation files, audit records, OSHA and workplace safety matters, WARN Act compliance, affirmative action plans, workers’ compensation liability, collective bargaining agreements, employee handbooks and policies, non-competes and other restrictive covenants, immigration compliance (including I-9s) and ERISA benefit plans. In other words, we know how to conduct a top-to-bottom review of a target’s labor and employment law compliance, and as litigators, we know where to find the hidden issues. During the transaction process, we create offer letters, draft employment agreements and restrictive covenants (e.g., non-competes), draft/edit the labor and employment aspects of transactional documents, and otherwise handle any labor and employment law task necessary to complete a transaction successfully.